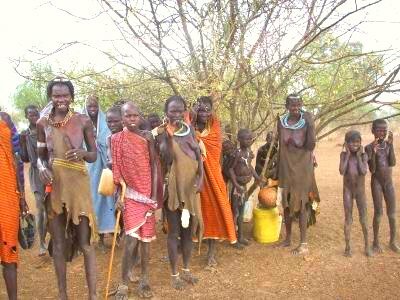 Meet the Toposa people. These traditional herdsmen live in a remote area on the shared borders of Uganda, Kenya and Sudan. 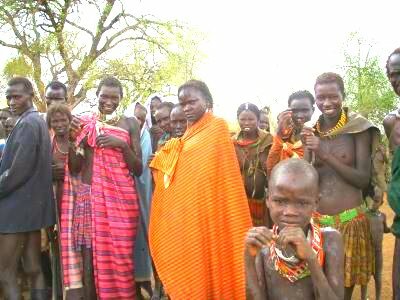 Their tribe is called "Karamojong" in Uganda, "Turkana" in Kenya (an area stretching from the Rift Valley to Lokichoggio) and "Toposa" in Sudan (from Lokichoggio to Narus and Kapoeta, in the eastern Juba). They live the life as it once was. Clothing is optional in their "country". If they have a cloth, serves the whole village, used when travelling outside the community. Their life is centered in function of their cattle. Their cattle is their life. Traditional diet is cow blood mixed with a sort of cassava. 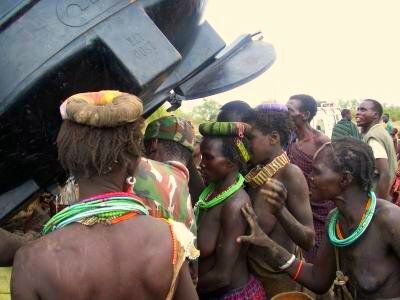 The family and tribe has a patriarchical system: Toposa men take decisions on behalf of the family or tribes in meetings where women and children are kept at a distance while the men discuss the people’s affairs. Tradition has it that important matters are decided in the early hours of the morning before sunrise. 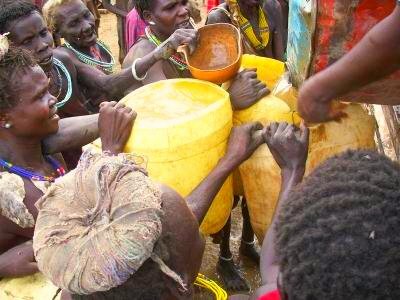 Last year, the Toposa in South Sudan faced drought, cutting not only their water supplies, but also their food production. Only delivering food aid was not enough, so we started trucking in water with the food. It was clear that a more permanent solution was to be found, to provide them with water, a rare item in the Toposaland. This solution was to dig a bor hole, where they could pump water from an underground well. We trucked in the mechanical pump, and connected it to a small plastic storage tank. A low cost, low tech but also low maintenance solution. 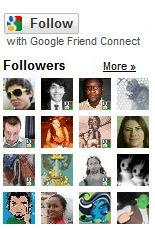 This post was written as follow-up to a previous one: World Water Day: One billion people without clean water. Pictures courtesy Constance Lewanika (WFP), with a special thanks to Cyprien Hiniolwa.